You might be forgiven thinking that all this continuous retail is starting to look like another south Windsor commercial strip - Walker Road south of Cabana – and that’s exactly what is happening. Rock’s president Rocco Tullio had purchased the land, the former Union Gas administration building on Division Rd., almost a decade ago. But it sat dormant as Tullio began developing Windsor Commons. Now the retail tide has turned as national tenants start recognizing Windsor – and the Division-Howard Ave. retail nexus with Devonshire Mall and the Roundhouse Centre – as a very promising location. “It was a little bit quiet there for a bit and then all of a sudden it just picked up,” Tullio said. 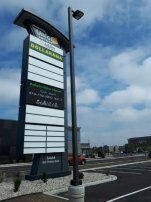 The first phase is coming together with a new sign tower erected, freshly paved parking lot and landscaping - and a couple of retailers now on site, Ashley Homestore and Dollarama. They join Windsor Commons’ Dollar Tree, JYSK, Marshalls and Pro Hockey Life. But the development is featuring restaurants that haven’t been seen in Windsor before. These include Freshii (now open), Five Guys, Blaze Pizza (artisan style pizza, owned by Five Guys) Qdoba and Chatime, a Taiwanese chain which serves various types of milk teas and juices – “a tea shop instead of a coffee shop,” as Tullio put it. There will also be an EasyFinancial outlet. That also resulted in creating smaller units “because there’s really nothing near the mall that can really accommodate smaller users,” he said. Tullio said lining up stores on the same side of the street as Devonshire Mall has proved viable. “Sure enough, a lot of the national tenants took interest,” he said. The second 70,000 sq. ft. phase will feature a major new national tenant he won’t name just yet because municipal approval is still needed. Tullio said he is keeping the side-by-side retail developments - Windsor Commons and the Shoppes at Union Square – with separate identities, partly because there are different ownerships including himself. Why is development along the emerging Division Rd. strip starting to gain traction?